The timing on this title was pretty much perfect, at least on a superficial level. I just retreated up north with my wife for a largely electronics free weekend to celebrate our anniversary (how she has put up with me for fifteen years as of the 26th is a mystery I can probably never solve). Still, I played a few games on my handhelds late at night/early in the morning when sleep was being evasive, and one of the titles I got to try out was Big Bass Arcade: No Limits for the 3DS. We spent a lot of time up north just taking in the pretty scenery, sitting quietly and enjoying nature. 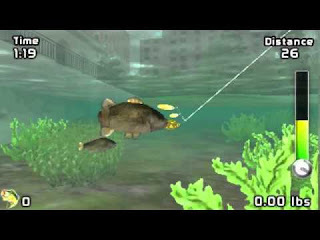 Big Bass has that sort of feel to it, because the graphics and audio do a nice job of conveying a sort of pleasant, relaxed vibe. The details could be a bit better, but the colors look nice and the 3D effect is actually quite decent, giving the visuals a sense of depth without straining my eyes. It has been years since I played a fishing game. I recall some of the older ones I played that were much more simulation than anything else. There was very little actual interaction in catching the fish, but here Big Bass does an excellent job at providing both strategy and some action. The strategy component shows up before you cast your line into the water as you try to pick your locations and bait with care. 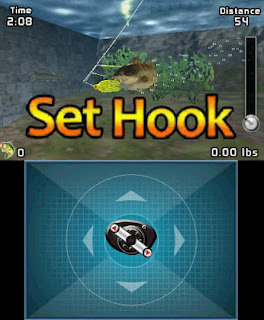 Once you try hooking the fish, that is where the 'arcade' portion of the game's title comes in, as you try to manage the tension of your line while reeling in the fish. The mechanics all work quite nicely on that front, as tiny fish are pretty easy to nab, but the notable big guys are certainly more elusive. You will want to play the tutorial after creating your profile - doing so will help explain some very important mechanics and save you some frustration and time as a result. 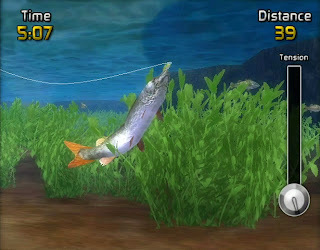 There is a fair amount to do in Big Bass as well, ranging from things like tournaments, free fishing and forty challenges. All the while the game keeps track of your statistics and accomplishments. There are several types of fish available to be caught and ten lakes to do it in, so you get a fair bit of variety mixed into it as well. This one surprised me - it was a fun downloadable title that I would score about a 7.5 out of 10 - so a pretty easy recommendation if you enjoy something a bit slower paced to spend your time on while you are on the go with your 3DS.